Did I find a p-hacked Motomed study? 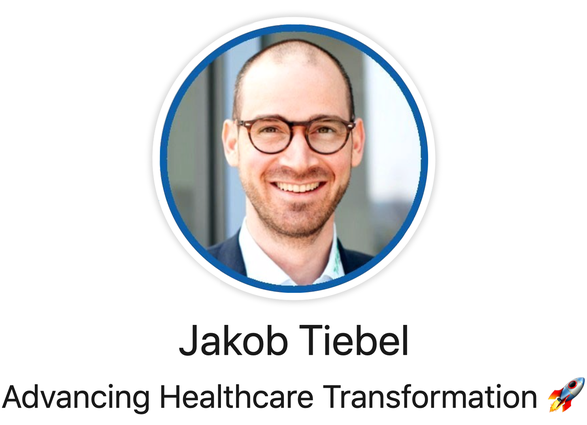 - jakob-tiebels Webseite! Did I find a p-hacked Motomed study? Today I have taken the time to analyse a study about cyclic movement therapy with motomed, published in 2005 by Kamps & Schule. I was most interested in the results of the 6-Minute-Walk-Test (6-MWT) because I've found some evidence that cyclic movement therapy may have a beneficial effect on mobility in general and specially on walking capacity after stroke. My aim was a detailed investigation of the reported effect sizes and the statistical power of the study. First I ran a post hoc power calculation with g*power to estimate the 1-beta error probability of the 6-MWT post intervention outcome, between the intervention and control group. I didn't really wonder that the study is highly underpowered, because of the small effect-size (d = 0.42), the low sample-size (n = 31) and the high variability of the data. Given the fact (and this is often neglected!) 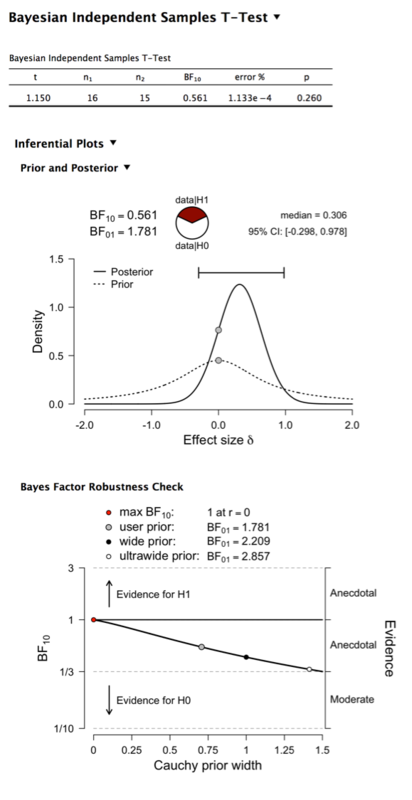 that low power reduces the likelihood that a statistically significant result reflects a true effect in the population, I planed to run a summary stats bayesian independent sample t-test. 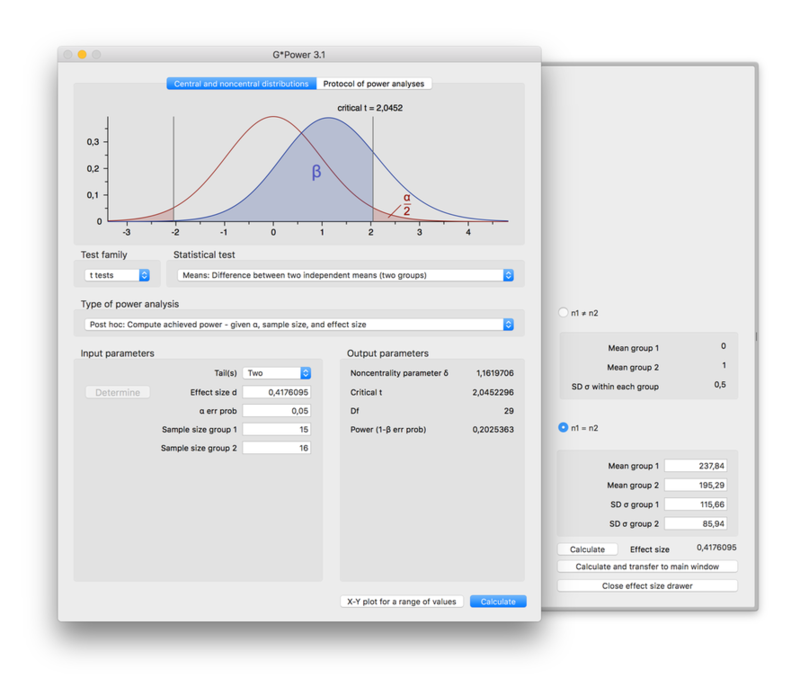 This bayesian alternative to a conventional student's t-test provides much richer information about the samples and the difference in means than a simple p-value and its more or less subjective interpretation of probability. Fig 1. Post hoc power calculation of the reported 6-Minute-Walk-Test results of the study. The sum t-test gave out a t-value of 1.15 and a p-value of .26, which means that the result of the t-test is NOT(!) significant. However, Kamps & Schule reported a p-value of .003, wich reflects a high significant result of their group interaction calculation. Even it's clear that they performed an ANOVA and not a t-test, I'm wondering how they got this high significant result. For my understanding that seems to be impossible! How they got this result? I don't know! Did the researchers report wrong results or is something wrong with my computation? Immediately I contacted Schule via researgate and sent him my calculations. Further I asked him to send me a protocol of the statistical analysis they made and/ or allow me to get access to the raw-data. Now I'm curious how the story ends and for sure I'll keep you updated! By the way... If I run the bayesian t-test with my computed values in JASP, I find a higher probability for the null hypothesis! Fig 4. Result of the bayesian independent samples t-test with a Couchy prior of 0.707 and my computed t = 1.15 value. UPDATE - 2019 Sep. 17th: He faded away when it was clear that I wanted to see the data... I got him as a new follower in research gate but didn't received any answer!